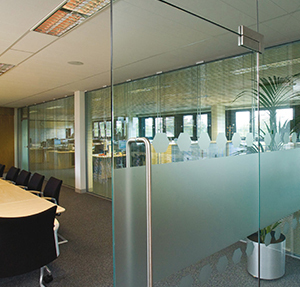 Tufwell offers a range of frameless glass partitions suitable for all office environments. Single or double glazed partitioning can be used with either blinds to enhance the interior design or to incorporate company colours and logos. Tufwell glass partitions consist of one-part head and wall abutments with two-part floor channels. 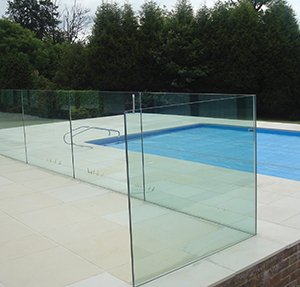 Using a 25mm high minimal glazing section gives the impression of a frameless wall of glass. Key features of glazed partioning are clean lines and unhindered vision providing the feeling of an open office environment. Privacy can be offered using electronically controlled specialist privacy glass incorporating an opaque switchable film, application of vinyl manifestation or blinds. Single glazed Tufwell glass partitions are used where some privacy is required but sound reduction is not essential. When creating office areas where confidentiality is essential you should specify double glazed partitioning for the optimum in noise reduction of up to 45 dB (Rw). Tufwell glass partitions are available in a range of heights, widths, glass thicknesses and frame colours which allows flexibility when designing office interiors. To find out more about our range of partitioning Contact Us – we are more than happy to advise or fulfil your glass partitioning requirements.